Crap. Crap. Crap. You woke up with a sore throat, and it doesn't really feel like it's "just the wind" that caused a slight bit of irritation. Resist the urge to tough it out. Strep throat is a disease -- a contagious one, at that -- caused by group A Streptococcus bacteria (hey, that's where the name comes from!). It causes the mucous membranes in your throat all the way down to your tonsils to get inflamed, and that's what hurts like a mother. When is strep throat most common? Strep has two peak seasons, one in late fall and one in early spring -- this also explains why it can sometimes be confused with allergies. That said, you can catch strep at any time of the year, so don't rule it out just because you're slogging through the dog days of summer. Strep usually shows its symptoms between one and four days of acquiring the infection, so once that sore throat starts, there's no turning back. One symptom you probably WON'T have if you have strep? A cough. If your sore throat is accompanied by excessive hacking, you're probably looking at a cold. Another point to remember, according to NYU Langone's Dr. Erich Voigt, is that strep appears clinically different in different people. So if you think you have strep, go to the doctor. And if you're not sure if you have strep, go to the doctor. Perhaps the most frustrating aspect of strep throat is that there's no way to definitively diagnose it without a test performed at your doctor's office. Childhood memories may serve you well again here: This is the one where the doctor sticks a cotton swab uncomfortably far down your throat and swirls it around there for what feels like an eternity. Then you'll get a rapid strep test, plus further cultures if necessary, to determine whether the dreaded Streptococcus bacteria is present. "The diagnosis should be confirmed by a rapid strep test or a culture," says Dr. Ray Casciari from St. Joseph Hospital in Orange, California. "The treatment of strep requires antibiotics like penicillin, cephalosporins, macrolides, and you must take the whole course, even if you feel better, to prevent complications like scarlet fever or 'superinfection.'" Superinfection sounds intense. You don't want a strep superinfection. "Some may have a severe sore throat, others a mild one, others may just have a skin rash, abdominal pains, body aches, or joint pains. Others may have very high fever and full body aches, so it can 'sound like an ouch' when swallowing," says Dr. Voigt. "There is also a particular odor that emanates from some people's tonsils." 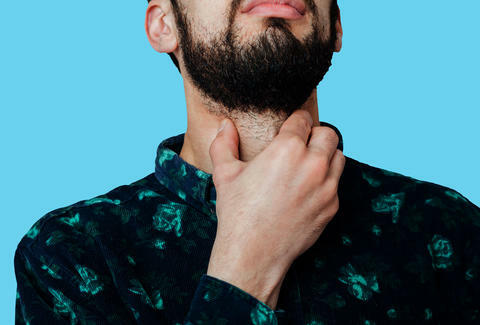 It is possible to self-diagnose to some extent, according to Dr. Casciari; if you have a severe sore throat, pus, and a body temperature greater than 101 degrees Fahrenheit in the absence of typical "cold" symptoms such as runny nose and itchy eyes, you should head to the doctor. If you have strep, home remedies won't quite cut it for this one. You need the good stuff: antibiotics. And it's important to finish every single pill the doctor gives you, or else you could be contributing to the global problem of antibacterial resistance. Still, there are certain things you should do whenever you get sick, stuff you've probably known forever. Stay hydrated, don't exert yourself, and get plenty of sleep. You can drink a soothing decaf tea or eat a frozen (nondairy) treat to alleviate your sore throat, but the best treatment is going to be antibiotics and rest. Once you get on antibiotics, you should start feeling better pretty quickly, usually within a day or two. At that point you're usually OK to head back to work, provided your work doesn't involve kissing or sharing cups, since you may still be contagious. Just make sure that you keep taking your medicine even when you start feeling like your old, strep-free self (to avoid the aforementioned superinfection and antibacterial resistance), and you'll be in the clear… until the next strep season rolls around. Helaina Hovitz is a writer who's glad she's out of prime strep throat age. Follow her @HelainaHovitz.